Educational and comforting too! How better to help your child confront a health condition than by letting them grasp the friendly looking microbe that's causing it? I love that I live in a world where this is a thing. That I could own a cuddly toy of the Black Death or leprosy. Such things appeal to my dark sense of humor. When I first discovered them (introduced by a gleeful Biologist friend), I couldn't stop laughing. I kept the tab open all night, and had to keep peeking back through the rest of the range, tittering anew with each fresh flick through the range. But there's a more serious side to this too. Giant Microbes present a cute, cuddly face for your children; a tangible form to clasp, as they come to terms with what's gone wrong with their health. Good for adults in the same situation too! It's easy to imagine a scenario where even the lesser of Giant Microbes' plush toys might console a sick child. Your little one is curled up in bed, laid low with any of the common childhood illnesses, feeling terribly ill and woe-begotten. They may know what's wrong with them, but what does that mean? Just a name attached to a fever, or spots, or a headache, or a pain in their tummy. In real terms, it's a bewildering moment, where everything has turned upside down. No wonder they need so much comfort and attention during this time. But then you hand them a plush toy suffering from the same condition. At the very least, it's companionship. If they're not in it for the empathy, then it's something on which to take out a bit of frustration. Then again, it could spark a whole new interest in science. Learn About Germs with Giant Microbes! 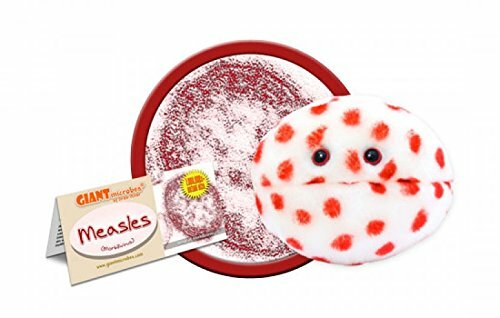 Where possible the Giant Microbe plush toys are based on the actual microbe causing the issues. Obviously they've grown in size to cuddle proportions, and some artistic license is allowed on how they look. For example, that's the real world chicken pox microbe over there. Which is a bit like the white ball, orange-red ruff of the stuffed toy version. Though it looks more like a demonic mere-cat in profile to me. 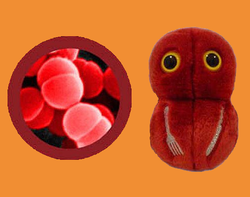 Every Giant Microbe toy comes complete with a picture of the real microbe, along with information about it. Your child could cuddle the toy, study the condition, and feel the effects. That's one way to immerse them in a learning experience! Just about every scientist friend that I know loves these toys. They are able to point to them and engage our attention at what's going on at a microscopic level. The most cursory glance at the comments from verified buyers shows how often the toy has inspired a broader interest in the science itself. Nor is everything about the microbes that are detrimental to human health. There are cuddly representations of those miniature armies fighting disease for us too. 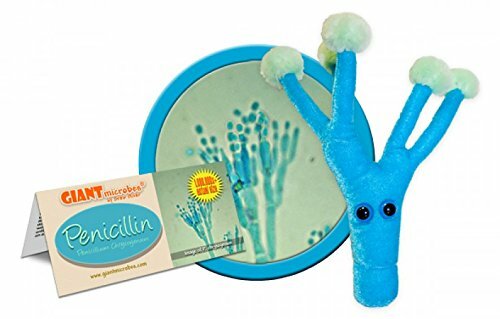 You could head off all complaints about taking penicillin, if your child could see the pretty, blue tree going in to kick their sickness into touch. Where I think the Giant Microbes range really comes into its own is when the condition isn't going to be resolved overnight. Let's face it, most childhood diseases are over in a week or two. The toy might not have even arrived by then, unless you chose a swift postal rate. But when the sickness is on-going, then your child is truly forced to come to terms with it. Especially when it involves prolonged bouts in a hospital bed, or a whole life put on hold. 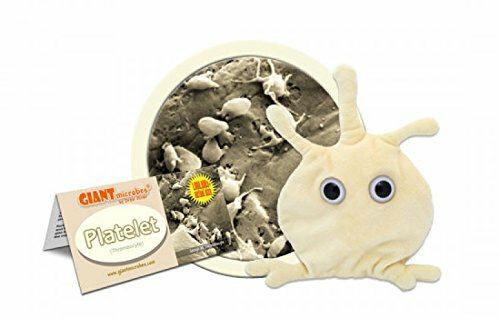 There are Giant Microbes cuddly toys to cover just about every eventuality, up to and including the aforementioned Great Plague. Some of them are surprisingly endearing. If you are in the unfortunate position where this is necessary, it's certainly worth checking out the full range. In the face of helplessness, it's somewhere to aim; a moment of amusement in an otherwise grim reality. It could well constitute the beginning of understanding, a gentle education just when it's needful. And it's a cuddly toy too. For those times when a cuddle is just what the doctor ordered. Cancer is a frightening prospect. But the newest drugs and medical advances are helping to cure more people than ever. Our cancer cell can be cured by turning it inside-out! 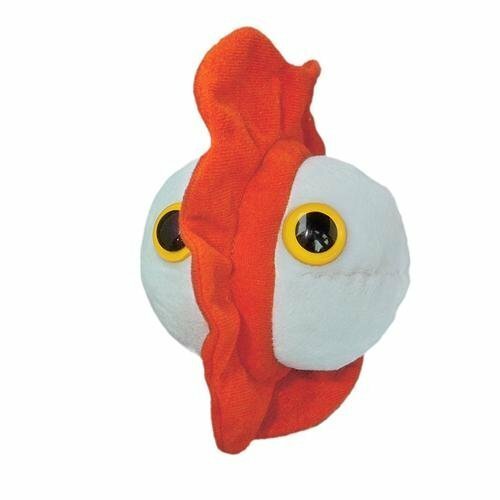 This adorable E-Coli plush is the answer to your germ fears. Ready to be loved or given as a gift, E-Coli is sure to make you smile. You won't find this adorable little bug in the Halls of Justice. They make great learning tools for parents and educators, as well as amusing gifts for anyone with a sense of humor! This Flesh Eating Microbe is ready to cuddle up next to you. Great as an educational toy for a little one or to bring a smile to a fun loving adult. Might be. But as at least one colleague has a cold at any given time, thanks to dealing with so many patients in a day, the common cold virus is undoubtedly the most appropriate. Yes! There is one of those! I'd half forgotten about these. Now I'm looking again and giggling immensely. They're wonderful! I want one of the common cold, if there is such a thing? I must look. I really find it weird - the last thing I would want when I am sick is the microbe. Cuddling and studying about them is going to enhance my fear and the sickness. I have to agree, however; the toys look pretty. Is My Kid Fat, Obese or Over Weight? Do you wonder if your child may be a bit over weight, fat, or even obese? Read this vital message now to learn the truth about your child's weight. In 1944 Dr. Hans Aspberger described the unique behavioral symptoms of a condition that closely resembled autism. Nail biting is a common practice among children, teens, and some adults. We have all found our fingers in our mouth at one time or another. But do you compulsively bite?